CINCINNATI - During practices last week leading up to a big game against the Steelers, quarterback AJ McCarron was throwing to a collection of running backs doing their best to emulate the Bengals receivers. Wasn't the same as hooking up with A.J. Green, Marvin Jones and Tyler Eifert. McCarron gets a full week of practice with the starting offence this week, knowing he'll make his first NFL start on Sunday in San Francisco because Andy Dalton is hurt. He'll actually get to work on his timing with the receivers, going with a game plan tailored more to his strengths. "It's just different getting all the chemistry back and taking a step forward," said McCarron, who got only a few snaps with the starting offence during the season. "It's fun." It's a big moment for McCarron, who will try to use his experience in national championship games at Alabama to help him get through his emotional first start. The Bengals (10-3) are on the verge of clinching their fifth straight playoff spot, and McCarron gets the chance to take them there. They blew a chance on Sunday by losing to Pittsburgh 33-20 at Paul Brown Stadium, with Dalton breaking his right thumb while making a tackle after an interception in the first quarter. McCarron, who had thrown a total of four passes in the NFL in a mop-up role, took over and threw a pair of touchdowns but also a pair of interceptions, one of which was returned for a touchdown that put the Steelers in control. Dalton found out on Monday that the thumb won't need surgery, so there's a chance he could return this season if the fracture heals quickly. McCarron gets to face the 49ers (4-9), who lost in Cleveland 24-10 on Sunday. The Browns had the NFL's worst running game, but rushed for 230 yards with their line opening big holes. The Bengals will likely try to follow the script, even though their running game has struggled. Offensive co-ordinator Hue Jackson said he's not reluctant to let McCarron throw a lot if necessary. "He's ready to assume any role we ask him to play within our offence, whether it's to hand it off, to throw it," Jackson said. "I don't have any reservations or limitations with him." McCarron was a fifth-round pick last year, a move by the Bengals to get a dependable backup instead of signing a free agent every other season. He missed all of his rookie season with a sore passing shoulder. McCarron was impressive enough during training camp and the preseason to win the No. 2 job. One of his biggest challenges in his first NFL start will be keeping his poise — something he learned to do while leading Alabama to back-to-back national championships. "I feel like I've been in a lot of pressured moments," McCarron said. "Pressure moments are when you get to shine the most. "I played in a lot in college. It's a different game at this level, but still big pressure moments and I feel like I've had a lot of those." 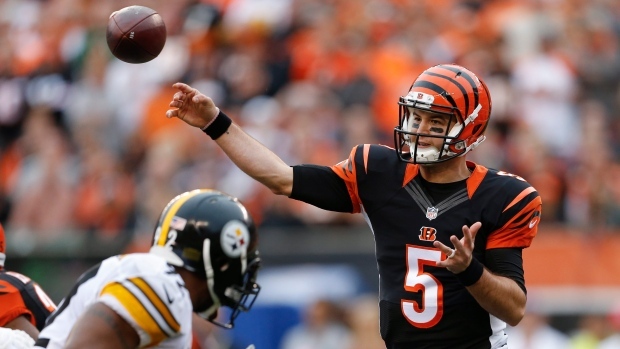 Notes: McCarron didn't get the football from either of his first two NFL touchdown passes. A.J. Green punted the ball into the crowd after his 66-yard score, and Rex Burkhead tossed the ball to the official after his catch. The Bengals were trying to get the ball from Green's touchdown back from a fan. ... The Bengals waived LB Chris Carter, who played in all 13 games and had six tackles and a fumble recovery on defence.